I am absolutely delighted to be able to say that I am now a stockist of Cambrian Mountains Wool! This wonderful yarn is spun from 100% Finest Welsh Mule. The Welsh Mule is a cross between a Welsh Mountain or Beulah or Welsh Hill Speckled ewe and a Bluefaced Leicester sire. The wool is soft and lustrous, and is worsted spun to retain these qualities. Cambrian Mountains Wool is a Community Interest Company. A CIC is a limited company with some differences which ensure a fairer way of doing business, such as a greater proportion of net profit being retained for projects beneficial to the community. Cambrian Mountains Wool was set-up following much work with – and the support of – the Cambrian Mountains Initiative. This is one of the rural Initiatives founded by HRH Prince of Wales to help support and develop upland hill farming regions. An opportunity was presented in 2014 to carry out a Feasibility Study to look at the possibilities (if any) of bringing wool, produced in the region, back into Wales as yarns for knitting and weaving in commercial and repeatable (and traceable) quantities. With the co-operation of the British Wool Marketing Board and Curtis Wools Direct, the study was launched with the 2015 International Design and Make Challenge which gave designers the opportunity to find ways to use the tops, yarns and fabrics that were being trialled. The resulting collection was toured as an exhibition to gauge interest, with much success. Which is how I first encountered Cambrian Mountains Wool! I saw the exhibition when it was displayed at the Hay Literary Festival in 2015 and was greatly impressed by the quality of the wool and its versatility. Depending on their craft the designers could use either 1kg of wool tops, 1kg yarn, or up to 3 meters of fabric of a plain woven structure (or a mixture of the three) to create a unique textile work – whether functional or purely decorative. I remember the exhibition clearly as the results were stunning: soft furnishings, wall art, garments, bags and more. In particular I remember a delightful wool sculpture of a knitter and her sheep by North Wales artist Ceri Williams that I couldn't resist photographing, and a knitted jacket with Elizabethan overtones by Sue James from Llynfi Textiles. 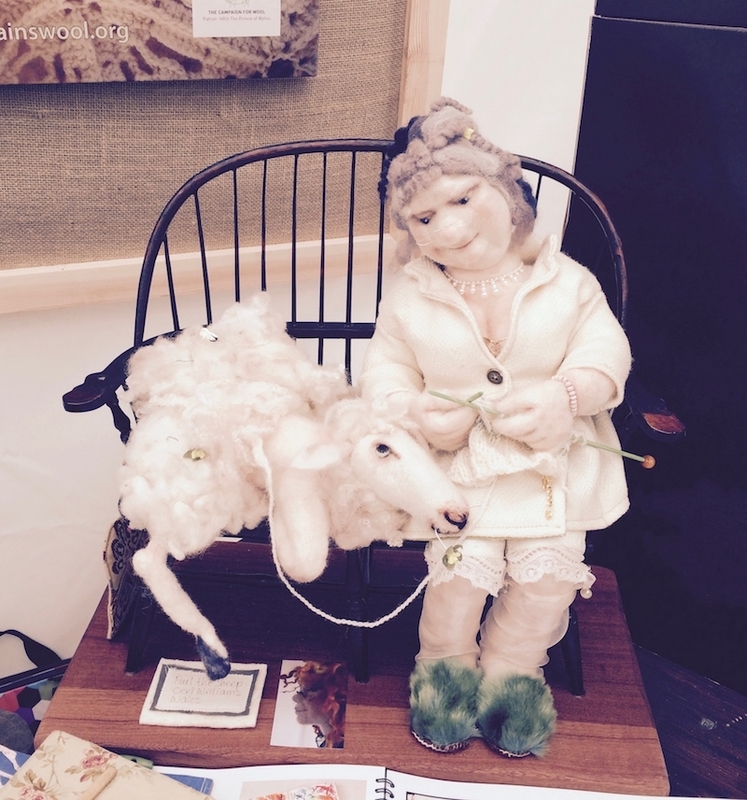 Above: Wool Sculpture by Ceri Williams on display at the Hay Festival 2015 – so endearing! It was this same jacket that caught my eye at this year's Edinburgh Yarn Festival where I met up again with Sue and began the process of becoming the first stockist of Cambrian Mountains Wool outside Wales! Hafan: 'haven' or 'home'. And the name of an old mine yielding a beautiful blue mineral. Welsh Red: a mix of oxide red and rusty old madder, with a dollop of mystical rowan berry. Not too red, not too rusty – Cottage doors and flannel petticoats. Mineral Yellow: a deep sort of yellow, not acid or bright. The yellow of the earth and the mines rather than the hedgerows. Ironstone: warm and cheery orange, not glowing. The slightly rusty orange that colours the local stone. Slate: that greyish, dusty purple – it’s all in the name. Shale: the darkest grey, softer than black – the abandoned spoils of the mine darkened by rain. Cegin: kitchen, homeplace; smokey warm, limestone and hooded fireplace. I'm just back from the Hay Festival, where this journey started, and delighted to receive my first supplies of Cambrian Mountains Wool project. I'm eager to get my first project on the needles but there will still be plenty left in the shop for you to come and squish ... I can't recommend it highly enough so do come and see for yourself!